This box set contains a Squadron of 2 x Cataphract Class Battlecruisers. 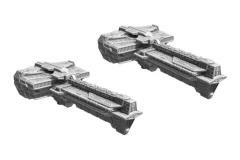 Each Battlecruiser mounts a twined pair of fearsome railguns down their central spine. However, unlike other Dindrenzi vessels, these weapons are optimized to forgo long range shots in favor of causing incredible devastation at closer quarters. Powerful engines and strong armor ensures the Cataphracts can complete their charge, while swift-tracking gun racks and clouds of remote mine explosives wreak havoc in the channel which the railguns carve through the enemy's formation.